The investment environment for a start-up hedge fund probably couldn’t be any tougher. This is particularly true for long/short equity funds which have incurred widening losses during the final months of 2008 amid the unprecedented volatility in global equities markets. But it is a fair bet that long/short equity managers who do outperform during such difficult times will lay the groundwork for a successful business that attracts investor custom in the years ahead. Entering this scenario is recently launched AlphaTran Capital LLP, a long/short equity fund that began trading May 21. The date is significant: May 19 marked the 2008 peak of the Morgan Stanley Composite World Index. From then until mid-December it slid 43%. The rapidity of the decline, particularly during the latter months of the year, has seen many marquee hedge funds names endure their worst ever drawdowns. Across the board the damage is also substantial with the Credit Suisse Tremont Long/Short Equity index ending around 20% down for 2008. 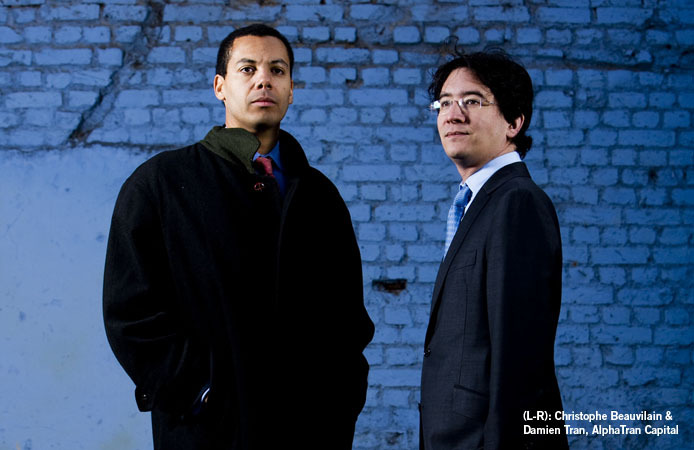 AlphaTran is the creation of Damien Tran, a former partner with The Children’s Investment Fund (TCI) until mid-2007, and Christophe Beauvilain, a former partner of Phylon Investment Advisors and, before that, a Goldman Sachs banker. The young Frenchmen retain that division of labour in their new firm. Tran is the lead portfolio manager with Beauvilain running the business, overseeing risk management and marketing the fund to prospective investors. The venture got critical backing early on from Thames River Capital LLP, the London investment management firm headed by Charlie Porter, seeding it with US$50 million. The fund has got backing for three years, a sufficient period to put down performance benchmarks and build the all-important track record required by many institutional investors. 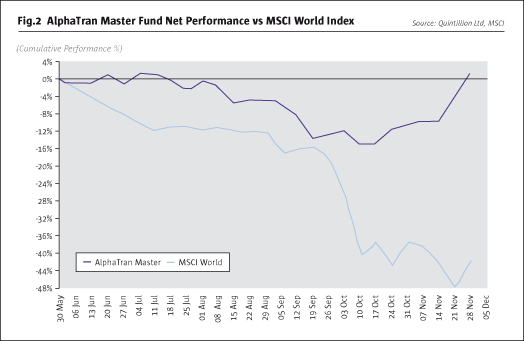 After an era of unprecedented expansion and diversification in the hedge fund sector, AlphaTran is seeking to get back to core principles and revive what might be called the classical long/short equity model that propelled the formation of a new breed of absolute return funds, such as Julian Robertson’s Tiger fund, in the 1980s. The purity of the investment approach means the fund doesn’t use derivatives, options or index instruments. The focus on using quantifiable business performance data to underpin the firm’s research process, means that hard-to-model, highly product diversified financial services as well as pharmaceuticals stocks are off limits. Instead, the fund looks to zero in on single product companies (Coca Cola and Nintendo are cited) where it can seek to gain an edge over other investors from information gathered through contact with suppliers and clients. The main sectors where the fund is active are retail, tech, industrials, consumer, mining and energy. 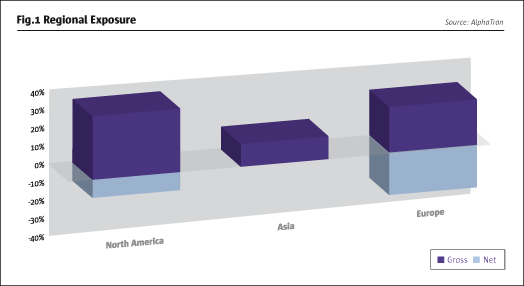 Although the fund is global, in practice about 80%-90% is invested in companies in the United States and Europe (see Fig.1). The investment universe amounts to 300 stocks from which the portfolio is comprised of 30 to 50 picks. The first hurdle for any stocks is market liquidity with minimum daily trading volumes required of US$10 million. A second hurdle is whether the analysts have contacts in the industry and a subsequent research edge over rivals. Because Tran invested in Asia with TCI, the fund is active in Asia, but the investment exposure is small and limited to a pool of just fivestocks. The timing of the AlphaTran launch put a premium on bravery. But surviving into 2009 has required rock-solid investment skills, notably at shorting. Given the plunge in long-only and long/short indexes, the fund’s 1.11% return to the end of November (helped by a short position on point of sale supplier Verifone returning 60% after an earnings warning) makes it a top-decile performer (see Fig.2). In the meantime, the hedge fund industry, to put it mildly, has issues. Some investors have offered penetrating critiques. Others are voting with their feet via redemption notices. Big changes are occurring and further upheavals in things like the terms of investment mandates, fee schedules and manager selection are certain. What the industry will look like when the dust settles is provoking wide ranging debate. Beauvilain also says investors may push to have the performance fee carry calculated on the returns a fund makes over the whole lock-up period rather than annually. If that occurred in a three year lock-up fund, which gained 40% in each of the first two years, but fell 50% in year three, the fund manager’s performance fee would be zero. Significantly, the partners see the growing allocation bias to big hedge funds (a defining trend of the industry in recent years) reversing. Like the dinosaurs of a much recounted earlier age, bigger hedge funds, especially in the long/short equities game, have had trouble adapting to the rapidly changing circumstances in the closing months of 2008. The AlphaTran fund aims to generate 20% annual returns net of all fees using a value and large cap bias. 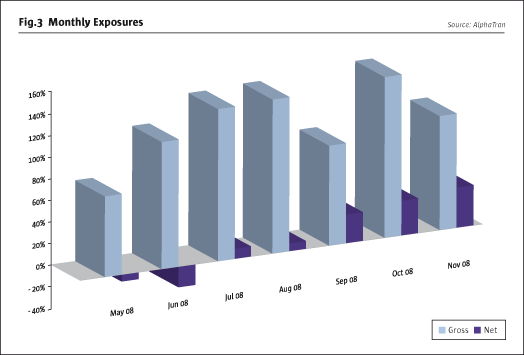 Gross exposure is to be between 150% and 200% over the course of the cycle with an anticipated net exposure ranging between -50% and 50%. In practice, so far, the fund’s net exposure has oscillated in a narrower band (see Fig.3). Tran’s background as a stock picker was honed in three years at TCI from 2004 during which he focused on the global short book and also contributed to Asian and other long plays. This followed a three year stint as a senior analyst with Ziff Brothers Investment concentrating the European long/short book for semiconductors, capital goods and aerospace/defence. He is joined by two investment analysts, Adrian Kowal, who worked closely with Tran at TCI, and Christophe Puyo, also a partner in the firm, who was previously a well ranked TMT buy-side analyst with Société Générale Asset Management. Joe Cusworth, also ex-TCI on the operations side, is running AlphaTran’s operations. Tran says the tight limits on the fund’s investment universe mean the team doesn’t get distracted. The investment process relies on extensive industry channel checks, using a proprietary network of industry experts leavened with consultants, research services and bespoke panels’ operators like Gerson Lehrman Group. For each potential investment, the team seeks consistent industry information from four or more independent expert sources. This is matched with bread and butter balance sheet and cash flow analysis. Another short was Crocs, the sandal maker. “When you look at some companies like Crocs you wonder: is it just a fad?” After much digging, Tran concluded that Crocs was over-distributed in the U.S., faced me-too product competition with no patent protection and had a limited new product pipeline. Market expectations, however, were for strong growth. Crocs, of course, dashed those expectations and fell precipitously. The long part of the book shows a methodical search for value (see Table 1). But the hunt reflects a private equity approach rather than the tough activism that is such a prominent feature of Tran’s mentor, Chris Hohn, of TCI. But the shorting discipline he learned there informs the whole portfolio. Several long positions the fund has held recently underline its global approach. One position is OPAP, the monopoly Greek lottery operator which carries a juicy 8% dividend. Tran likes the “nice, steady return of cash” and notes that the firm is immune to shorting pressure since the practice is banned in Greece. Another long position has been IMS Health, a leading U.S. provider of market intelligence collected from doctors and sold to the pharmaceutical and health industries. The firm possesses a degree of pricing power and some immunity to the demand pressures afflicting many other economic sectors. A more unusual part of the long book is Sino-Forest, a Chinese wood pulp producer listed on the Toronto Stock Exchange. Tran says the net asset value of the company’s forest reserves is about three times its share price, while the price of wood fibre is expected to rise. The catalyst for the increase is Russia’s plan to raise timber export prices in 2009. Kinsey-Quick also praises Tran for adapting quickly to the changed market conditions from late summer onwards, getting more aggressive with his shorts and embracing a more short-term trading style. “Although Damien was brought up in a long only activist style, he realised very quickly he had to adapt to a different environment,” he says. Beauvilian says AlphaTran saw over 20 potential seeders. “In the end it comes down to being comfortable with the person you are talking to. We got mutually comfortable, ourselves and Thames River, very quickly,” he says, a view that Kinsey-Quick echoes. For most portfolio managers, leaving a firm like TCI, when it was among the most celebrated hedge funds anywhere, would be a bit ominous. Giving up that infrastructure and the culture of success must have brought some stresses and strains, and perhaps a sense of isolation. In short, it must have been a bit daunting. Tran agrees: “It is. But it is quite exciting because you have much more freedom. I’ve always wanted to run my own shop. I know Joe Cusworth and Adrian Kowel very well, who were both at TCI.” (Cusworth on the operations side; Kowel on the investment side). Starting small, he adds, avoids building up big overheads and the risk of people leaving the firm after several months if capital allocations occur more slowly than expected. Certainly, that is a prudent approach to the current difficult environment. But despite the storm clouds continuing to buffet markets, AlphaTran has some interesting themes to explore in 2009. The big falls in so many companies’ stock prices spells opportunity. “It is true that companies might have six to twelve months of bad numbers and a lot of debt, but some of the companies will get stronger and do well,” Tran says.